Much of the fun of film photography comes from the cameras. 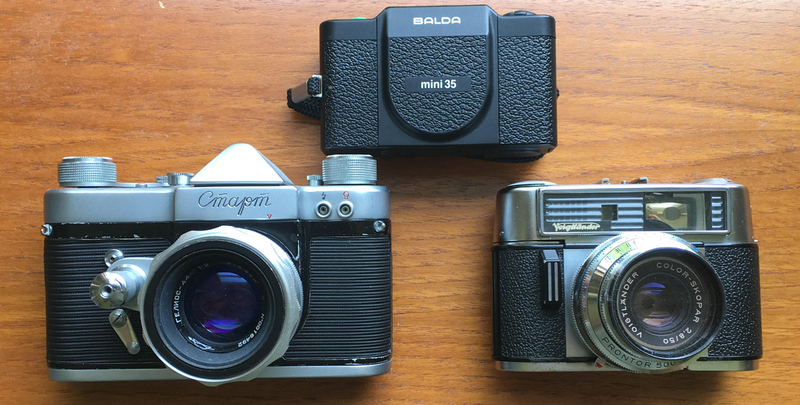 Believe me, in nearly 20 years of collecting and using old film cameras, the cameras I’ve shot with – and that’s several dozen of them – are only the tip of the iceberg. The 20th Century saw tens of thousands of different cameras made by manufacturers all over the globe; huge large format cameras and tiny spy cameras, art deco folding models and premium compacts with a sophisticated electronic brain. I have certain cameras for certain things – I shoot my soundcheck photography project on a Nikon FM2N and a Nikon F100, and use my Pentax ESIIs when I travel – but part of the fun is finding new (to me) cameras, loading them with film and shooting with them. I literally can’t walk past a secondhand camera store or a market stall with cameras on it. I have to poke my nose around. You never know what gems might have mistakenly have a £5 sticker on them. So ye, I’m one of those poor souls who suffers from GAS (Gear Acquisition Syndrome) – that disease that empties bank accounts and fills camera cabinet shelves the world over. There is no cure that I’ve heard of (or wish to try). I have some kindred souls in this department – Bellamy Hunt of Japan Camera Hunter, Hamish Gill of 35mmc and the might Em from EMULSIVE. Together, we’ve decided to set up a Facebook group for fellow sufferers.